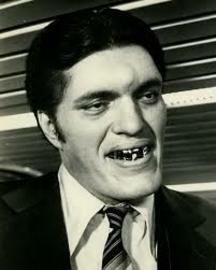 Richard Dawson Kiel was an American actor, voice artist, and comedian, best known for his role as Jaws in the James Bond franchise, portraying the character in The Spy Who Loved Me (1977) and Moonraker (1979); he lampooned the role with a tongue-in-cheek cameo in Inspector Gadget (1999). His next-most recognized role is the tough, but eloquent Mr. Larson in Happy Gilmore (1996). Other notable films include The Longest Yard (1974), Silver Streak (1976), Force 10 from Navarone (1978), Pale Rider (1985), and Tangled (2010).